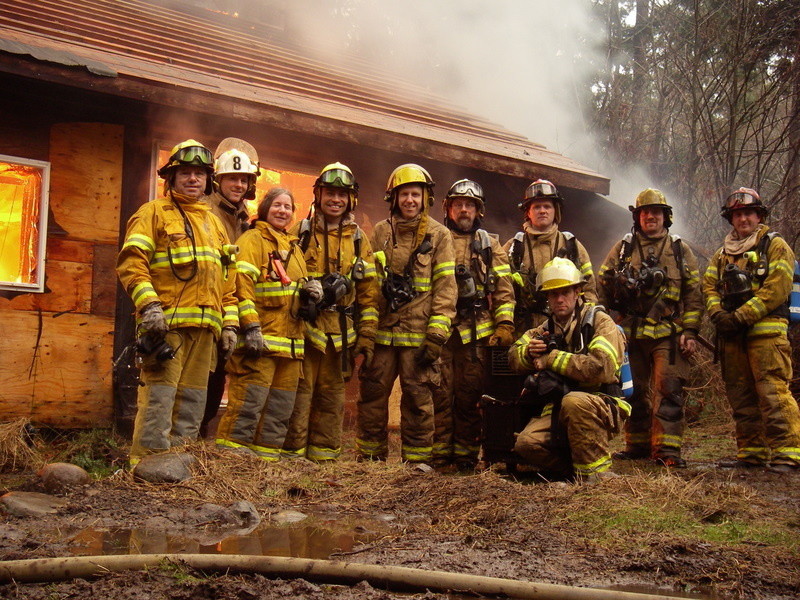 The HIFR crew outside our recently donated burn house. Note the beaming rookie in the middle. Pat spent some quality time inside a burning house and blogs about it here. Hornby Island Fire Rescue sent Deputy Chief, Doug Chinnery, to participate in a large exercise that took place in Oyster River. The operation was to simulate a wildfire that was approaching a rural subdivision. Several area fire departments took part as well as the RCMP, BC Ambulance, Emergency Social Services, BC Department of Forests, 19 Wing CFB Comox, and Comox Valley Search and Rescue. The fire departments’ involvement was a 1 day classroom and practical training session on Saturday followed by more classroom time on Sunday morning before the actual exercise on Sunday afternoon. 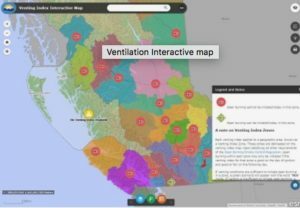 This weekend was of particular interest to HIFR as Hornby Island falls entirely into the wildland urban interface zone and we are at least 2 hours away from any outside help. If there was ever a wildland fire on Hornby, the fire department would be on our own in managing property protection for quite a while. It was a very well run course and the exercise itself provided much additional insight into how to better protect the Hornby residents and their property from wildland fires. Thanks to Niels Holbek, Chief of Oyster River Fire Rescue for his invitation and his hospitality. At last night’s practice Duncan and Julian completely outdid themselves. They organized a school bus, a dozen or more volunteers from the community, props, makeup, and a smoke machine to build a very realistic scenario. We arrived on scene to find the school bus billowing smoke, and 10 – 20 people banging on the windows and calling for help. Our triage team boarded the bus and in short order had all of the walking wounded out of the bus and started work on the 5 remaining injured. All 5 of those patients were packaged for their particular injuries and all came out on a spine board. We had the last of the seriously injured patients out of the bus about 70 minutes after we arrived on scene. There is the obvious medical care component in dealing with injured passengers. Last night we had a cardiac patient, a head injury, a fractured hip, and 2 spinal fractures, along with all the miscellaneous cuts, scraps, and minor breaks. We called on our fire suppression skills with the simulated fire under the hood of the bus. In getting the front of the bus open, we needed to use our extrication tools and know-how. The incident commander needed to call on some extra logistic planning skills to deal with limited resources for so many patients. It was a challenging practice, but I believe that we rose to it and I was thrilled with how we performed. While there were several things that we would do differently next time around, this practice made all of us feel confident that we are able to handle a situation like this if it were to happen here. Thanks to Rubin, Zsofine, Scott, Olivier, Heron, Sascha, Juniper, Nico, Aarron, Gwynna, and Reina for taking an evening out of their lives and helping us hone our skills. Support like this from our community really helps us with our commitment to the department. We’d like to single out and mention Duncan and Julian for all of the work that they did to set up this practice. Getting the bus, researching ins and outs of triage, all of the phone calls to organize the volunteers, and the time spent setting up the scene demonstrates an enormous dedication to the department and our training program. 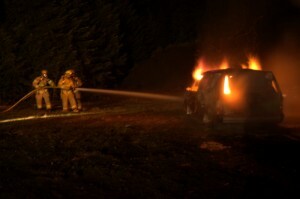 We don’t get very many car fires here on Hornby. In fact there hasn’t been one since I joined the department. 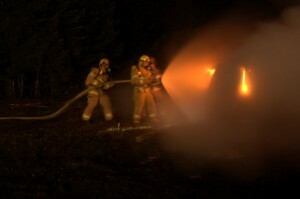 Despite their infrequent occurance, extinguishing them safely is a skill that we like to keep up on. To that end we have constructed a prop which is a stripped minivan that we can pack full of wooden pallets and set on fire. Bumper struts can explode shooting a bumper into a firefighter’s knees. Air bags can explode with shrapnel. Hatchback struts can explode and shoot a metal rod like a crossbow bolt. Newer cars have plastic fuel tanks which can drop off of the car and melt releasing gasoline onto the ground. 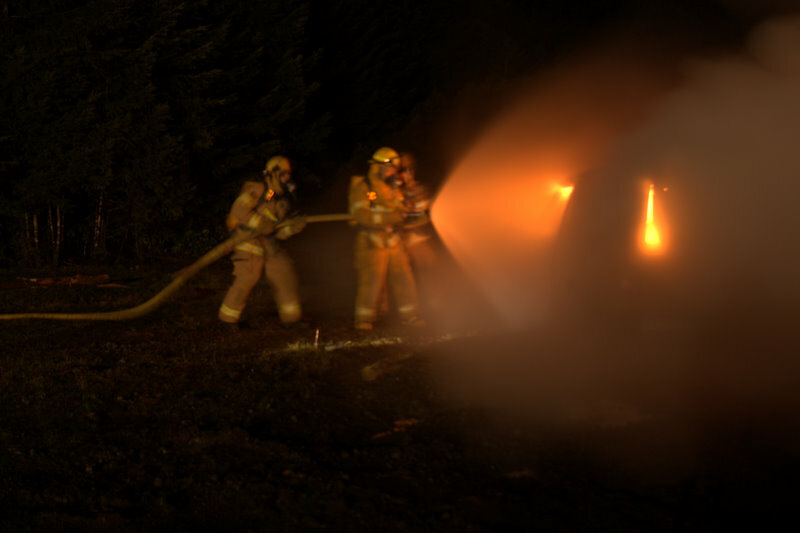 Working in teams of three, firefighters approach the vehicle from the side or corner dumping as much cooling water onto the flames and under the car as possible. When they get close they open the nozzle pattern to a fog to protect them from the heat of the fire. Once at the car, the nozzle pattern gets narrowed again to fit through the window and extinguish the fire.